I absolutely love children’s clothes. There are so many beautiful ranges available at the moment, and so many designs to choose from. Buying clothes for the kids is my guilty pleasure, and I really enjoy putting amazing outfits together for them. I was recently contacted by a brand named Little Pancakes. It’s not a brand I was familiar with, so I headed off to check out their website – and I loved what I saw. 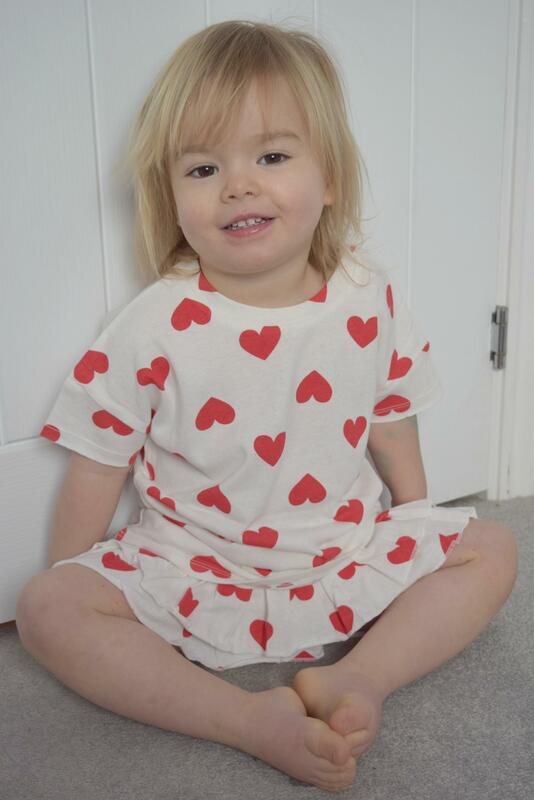 They have a beautiful range of clothing for little ones from birth – 5 years. They believe that our little ones should be able to be fashionable from the bodysuit they sleep their first night in, and their website includes a wonderful selection of organic cotton items from established sustainable brands. 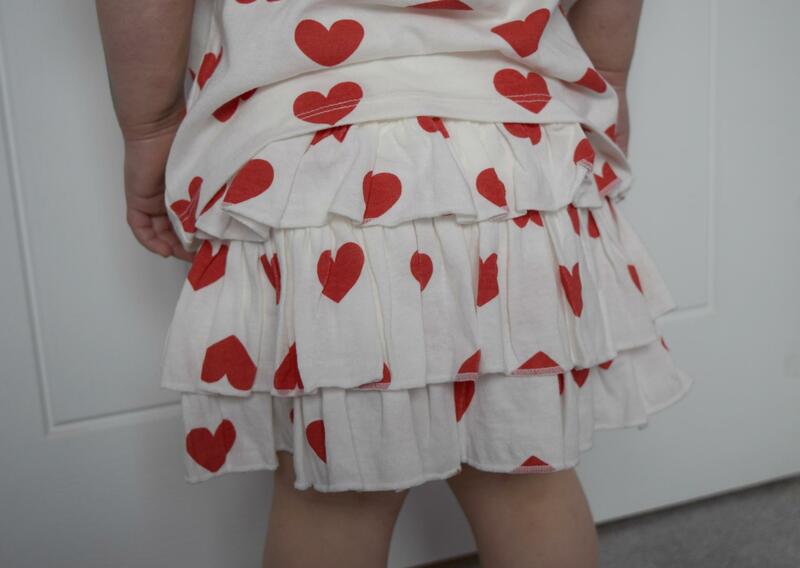 Eliza was sent the Heart skirt and tshirt to try out. This is available in black or red, and available as 2 separate items. We have tended to wear them together as a full outfit, but the tshirt would look just as funky with some jeans or leggings and I am planning to pair the skirt with a plain red top too. The skirt has some gorgeous frills all over, which give it a lovely shape. The skirt comes with inbuilt shorts underneath, making it perfect for climbing, jumping and playing in without the risk of underwear being on show. The waist is soft and elasticated, so it is comfortable and will grow with your child. We went for age 3-4 as Eliza will be 3 in June, and I think it’s pretty true to size, and will be spot on for the summer. The tshirt is again true to size, and a perfect match for the skirt. It’s a good length, sitting just below the waistband of the skirt, and there is plenty of growing room overall. Both the skirt and tshirt are made from 100% cotton and are machine washable and able to be popped into the tumble dryer. They aren’t the cheapest brand – the tshirt is £19.99 and the skirt £31, so I am not sure they would be somewhere I would look for everyday clothes, or for things suitable for nursery. Having said that, for a special occasion, or for ‘smart’ clothes for parties and events, I will definitely be checking out Little Pancakes again. I absolutely love this outfit, Eliza looks so cute :o) It’s a shame that Little Pancake only make clothes for younger children, they have some beautiful, beautiful clothes on their website. Aww! What a cute outfit. She is just adorable. Kim Carberry recently posted…A white chocolatey treat from 31Dover…. Oh my goodness, that dress is just the cutest! I love the design – how cute. Organic clothing does come more expensive but I’ve found in the past that it’s worth it. Eliza looks adorable in her new outfit, I do love a good ra ra skirt.